The Jazzy® Select 6 mid-wheel drive provides maximum front stability, combined with the advantages of in-line motor technology. It features Active-Trac® Suspension and 6” front and rear casters for superior performance indoors and out and 10″ drive wheels. 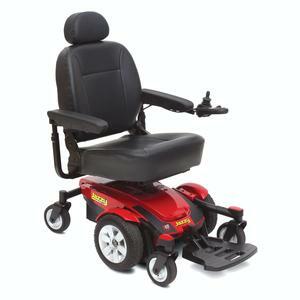 An impressive selection of standard convenience features make it the easiest power chair to use. 36.625″ Unit Weight: 192 lbs.